What a great Fourth of July—love of country and fireworks. 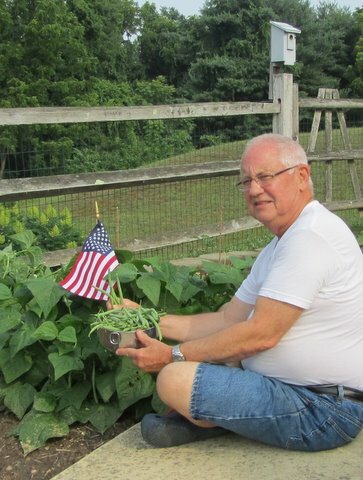 I hung our red, white, and blue from his holder on the split-rail fence between our Tomato Patch and a perennial bed. But for the big celebration, I’m at the age when the best view of the fireworks is right at home on television after watching PBS and the “Capitol Fourth” extravaganza on the National Mall. But earlier in the day—before the heat and humidity wilted me—I stooped to pick three bowls of Tenderpod snap beans from a four-foot row in one of our small vegetable gardens. But in 2011 I generally call them “green beans.” Green they are, and beans they are, no question. And what a treat to pick a green bean and eat it raw—with its nutty fresh taste. I wouldn’t do that with a limp, discolored bean I typically find in a grocery-store bin. And then, within an hour or two, I cooked a few handfuls—with just a sprinkle of salt—just five or six minutes at most, so they’re still beans, tender, yes, but not mushy. Easy now. Put aside your fork and pick up a perfectly straight and cooked green bean by an end, put it into your mouth, and savor the flavor and texture. Oh, my, that’s really celebrating the Fourth! Veggie fireworks! I'm loving the fresh beans this summer! Last year's pole beans were not so good, so I'm trying lots of different bush bean varieties. I've been particularly impressed by flat Italian beans, both yellow and green. Also, “Jade” green beans are doing beautifully and taste fantastic. The weakest showing is from the round yellow beans. They are my father's favorite, but the plants are puny and the beans are not very robust. My daughter is pleased with the slender purple filet beans, they turn dark green when cooked and have a fine delicate flavor.